$28.89 (40 cents per k-cup) with the 15% Subscribe & Save discount, if you can take delivery of 5 or more active subscriptions in one month. 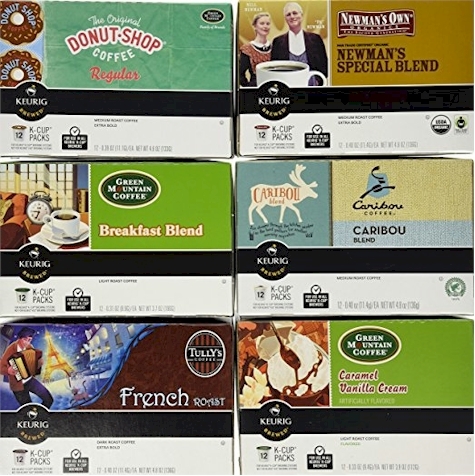 $32.39 (45 cents per k-cup) with the standard 5% Subscribe & Save discount. All of these k-cup flavors are under the kosher supervision of the OU. You can stock up and order multiples of any Subscribe & Save item (and your Subscribe & Save discount will apply to any quantity that you order, though any coupons will be applied just once). Here's how: first, select the "One-Time Purchase" option, and then the quantity drop-down should appear. Select the quantity that you would like, and then re-select the Subscribe & Save option. When you continue to check out, Amazon will have applied the quantity that you chose to your Subscribe & Save order.